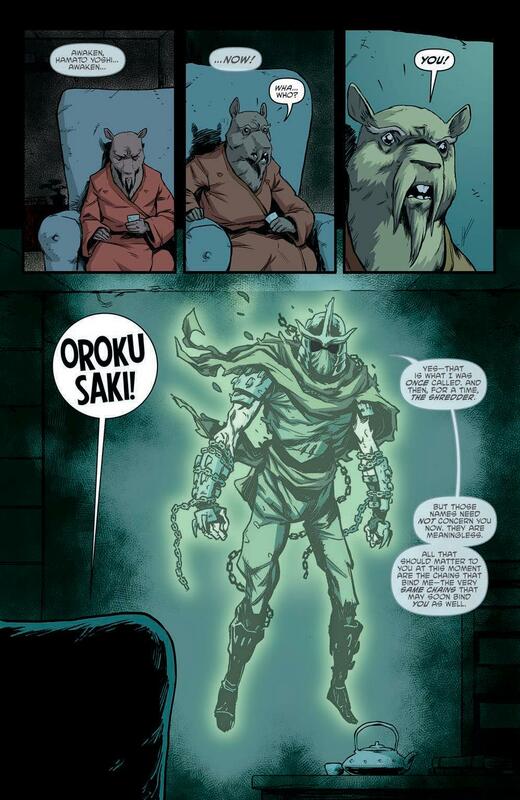 Since the shocking events of issue #50 where he killed his long-time rival Oroku Saki and took his place as leader of the Foot Clan, Splinter has been crying out for some real attention. 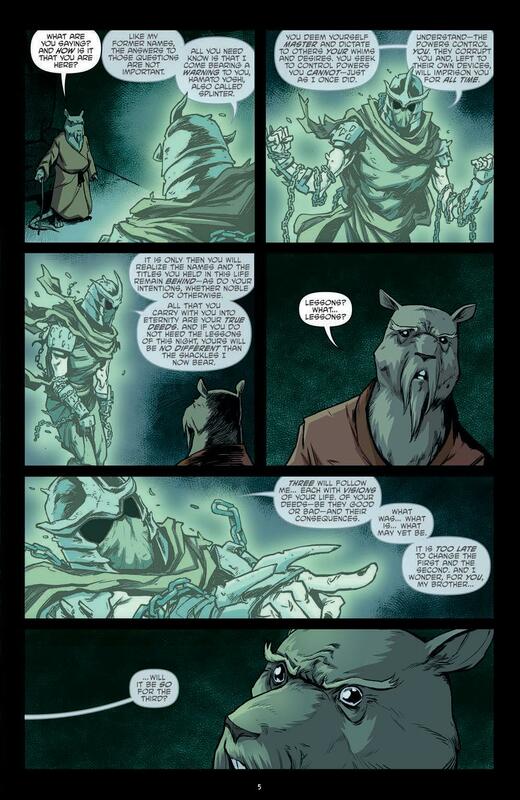 Despite serving as the catalyst for some intriguing changes in the brothers themselves, Splinter has felt very much like a background force for quite some time now, almost like a plot device rather than a character in his own right. As such, it’s always welcome when Waltz, Eastman and Curnow shine the spotlight on him, and that’s exactly what we get here with the TMNT version of Charles Dickens’ A Christmas Carol. 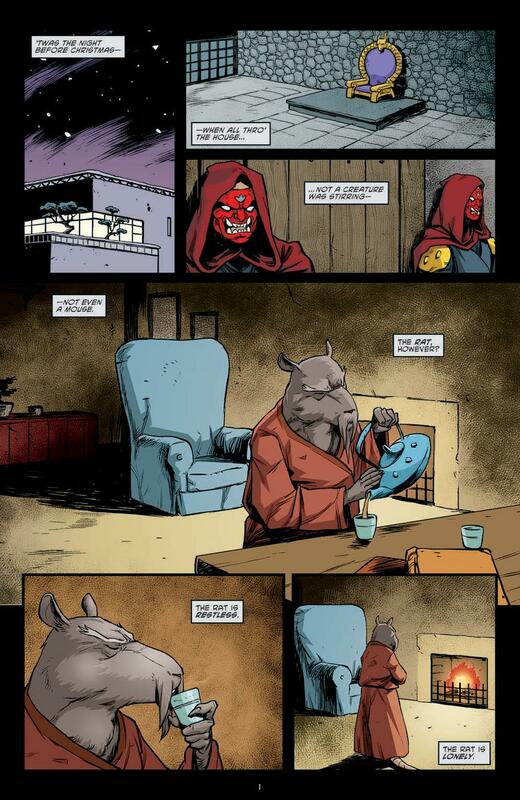 In this issues, Splinter is visited by three spirits, each of whom help to give the reader some added insight into Splinter’s current mindset and the hidden conflicts he struggles with on a daily basis. By far the most interesting part of the issue is the “yet to come” portion, which takes us into a bleak version of the future in a scene which seems to provide a fairly strong hint at the direction this series is headed in as we close approach next November’s eagerly-anticipated 100th issue. 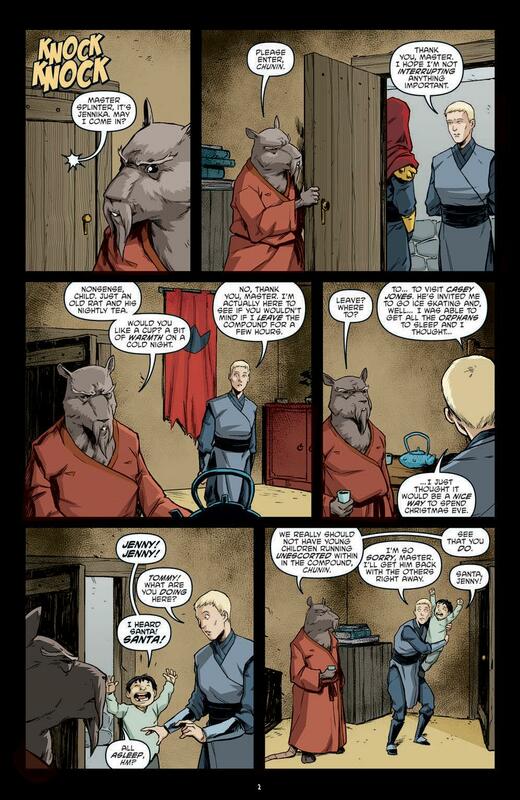 It’s clear that the situation between Splinter and Clan Hamato is going to come to a head sooner rather than later, and much like Ebenezer Scrooge vowing to change his ways in order to erase the name on the headstone, it’s going to be interesting to see if Splinter changes his outlook over the next year in order to avoid the shocking events he is witness to here. Michael Dialynas is back on art duties here, providing his typically high-quality visuals and delivering the narrative and character beats with a sense of urgency. 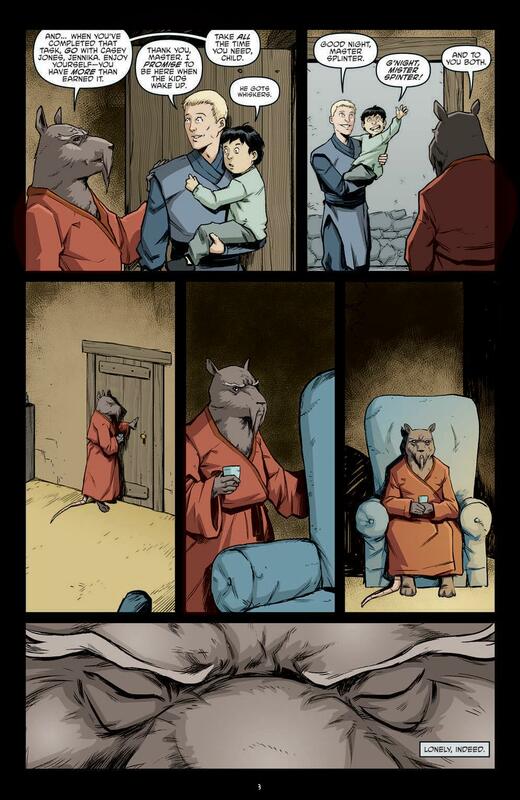 The choice of characters to represent the spirits gives him opportunity to play around with some new faces, and he does an impressive job of conveying a great deal of emotion on the usually stoic face of Splinter. The conclusion to the story is admittedly a little cheesy and sappy, but you know what? It’s Christmas. And if you can’t get a little sappy at Christmas, when can you? And after years of pain, suffering and loss, it’s great to see our brothers and their father having a little bit of fun, even if it’s only for a page or so. 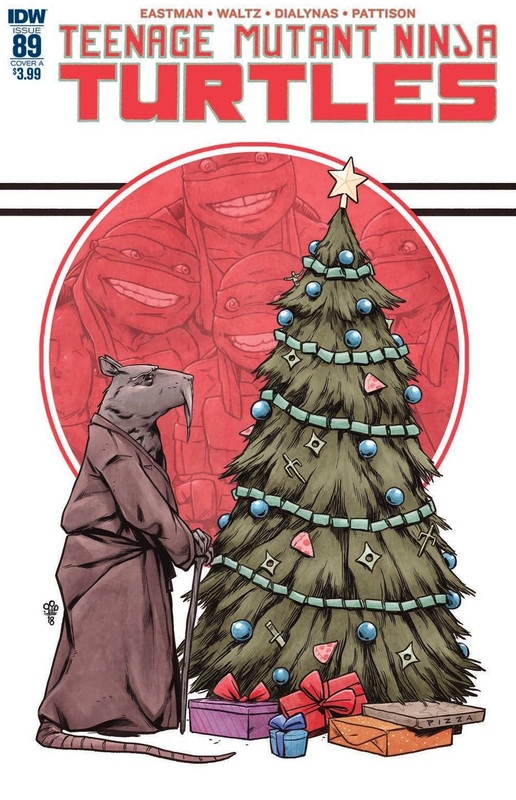 It’s perhaps not an essential read in terms of ongoing continuity, but it’s still a thoroughly enjoyable festive-themed issue that gives us a much-needed reminder that behind his current role as the unflinching, frequently ruthless leader of the Foot Clan, Splinter is still the same loving father and conflicted patriarch he always has been. Great stuff.